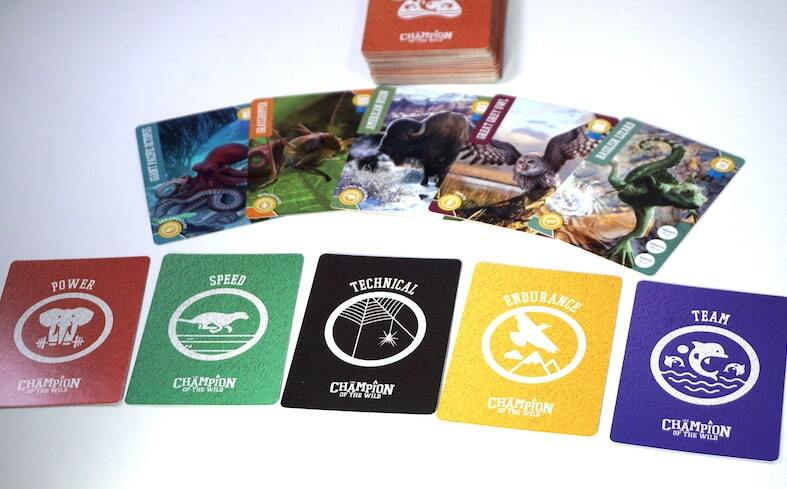 The Champion of the Wild, from Big Imagination Games, is a voting and negotiation game for 3-8 players. Coach your animal(s) to victory in a series of competitive events. Listen to our thoughts in about 5 minutes, or read the summary below. The group decides on 3 types of events to play. Once the events have been selected, choose a single animal from your hand to compete in all of the events. Events are not limited to “serious” sports like hurdles, sprinting, and swimming, but also include gems such as: egg-and-spoon race, hot dog eating contest, royal rumble, animal car crush, and break dancing. The group must talk through the events one at a time. After all players have negotiated and argued for why their animal should win this particular event, everyone votes using secret tokens for 1st, 2nd, etc. place. 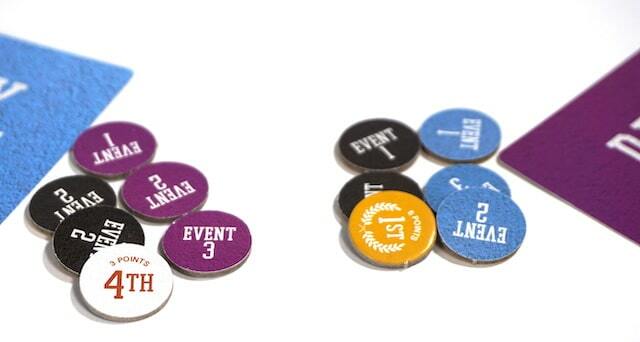 Once all events are completed, add up the points for all the tokens you have received. The player with the highest tally is The Champion of the Wild. We previously interviewed Tom Clare, the creator of the game. He told us about the second edition of the game, which adds new events, animals, and modes of play. We can’t deny that The Champion of the Wild is fun. It’s a great opportunity to be ridiculous and creative. I really enjoy the opportunity to use my ridiculous Calvin’s-dad logic to try to win a game. We found that it was hard for our kids to make the ridiculous arguments necessary to have fun. Although kids are naturally creative, they’re not necessarily very persuasive. This meant that the game tended to drag in a mixed group of kids and adults. The second edition does address some of these issues by introducing a “Junior Pentathalon” mode of play, which is easier for children. The voting tokens work well to keep things balance. Coming in first place in an event will help you, but it won’t guarantee a win. We appreciate that there’s something at the end of the game – there is a clear Champion. We recommend The Champion of the Wild as an alternative to party games like Apples to Apples or Cards against Humanity. Rather than just pulling a card to make someone laugh, you need to back up your choice (no matter how ridiculous). Play with your children with caution, perhaps letting them pick a different animal for each event. The Family Gamers received a review copy of The Champion of the Wild from Big Imagination Games.